Episode 8 of The Real Housewives of Atlanta is now behind us. "Tea With a Side of Squashed Beef" is not really an accurate title. In my opinion, the beef was never squashed, and you know I have the evidence to prove it! But let's get started with the recap first. Phaedra thinks Apollo let their family down. Although she gave him numerous legit business ideas, like the fitness video, and the funeral home, he chose the life of crime (once again.) Can't teach an old dog new tricks, Phae-Phae! Nene Leakes meets up with her new lap dog, Porsha Stewart Williams, and they discuss the possibility of meeting up with Cynthia Bailey and Kenya Moore to squash their ongoing beefs. Porsha is a little apprehensive, but she's willing to tag along with Nene because you know she ain't got nothing better to do at this point in her life. Kandi Burruss meets up with the Old Lady Gang for a home cooked meal of some KFC and Sara Lee dinner rolls. So, Kandi closed on the house that she purchased for Mama Joyce, but she's a little upset that Joyce won't give her a key to the new home. Mama Joyce thinks that since she doesn't have a key to Kandi's house, she shouldn't have to give Kandi a key to her house either. Ummm...how are you not gonna have a penny to your name, but continue to make demands? If Kandi wants a key to the home that SHE bought, she should have the right to trot her centaur booty down to Home Depot and get her a key made whenever she feels like it! Why does she continue to let her mom punk her like this? Kandi also felt the need to relay everything that she and Ms. Sharon discussed during her trip to New York. Kandi even went as far as to tell her mom that Ms. Sharon said she was going to punch her in the mouth. How old is Kandi? Does she not realize that by going back and forth and relaying messages that she is actually causing more problems? She is brewing up beef and will run and hide her hands once the poop hits the fan. Kandi is not slick, I'm on to her and her passive aggressive/conniving ways. Since Claudia Jordan is new to town, Cynthia took it upon herself to bring her to Derek J's salon to get her an Atlanta makeover. All he did was run a curling iron through her weave so I didn't bother taking a picture of the results. While at the salon, Cynthia gets a text from Nene asking her if she wants to meet up to discuss some things. Nene also asks Cynthia to bring her "girl" Kenya Moore with her. Cynthia should have known this was a setup. Meanwhile, Kenya is checking out office space with her friend, Brandon. What exactly does she need a 1,500 square-foot office for? The world may never know. Kenya gets a call from Cynthia while she is touring vacant offices. Cynthia tells her about Nene's invitation to meet up and discuss their issues. Kenya thinks it's strange that Nene wants her to come along since she has nothing to do with Cynthia and Nene's beef. In the end, Cynthia pretty much demands that Kenya go with her to the meeting, and she agrees to tag along. Claudia's ninety-year-old grandma and her mom came to visit her for the first time. Isn't her granny hilarious? I love old little ladies, they are such firecrackers. They have no filter whatsoever! Ugh, this midget...look at how high that desk is. Her stubby arms can barely reach her cell phone. Can Kandi please invest in an ergonomic desk so her little nubs don't end up with carpal tunnel? Kandi tells her husband, Todd Tucker, about her meeting with Mama Joyce and the Old Lady Gang. Kandi tells Todd that she told Mama Joyce about Ms. Sharon wanting to punch her in the mouth. Todd was like, "You didn't have to tell her that." Kandi says, "Your mama told me to tell her that!" and Todd's response was, "Yeah, and I'm sure it helped the situation, huh?" How is Todd making so much sense while Kandi is just like a rabid teenager that wants to see two people fight after school? Todd tells Kandi that there's no way they can have their mothers in the same room during the holidays. He has decided if Mama Joyce wants to go to their house for Thanksgiving, he will fly to New York to be with his mother instead. Kandi is upset and huffing and puffing because she doesn't think that she needs to be apart from her husband just because their mothers can't get along. I'm with Todd on this one. If Kandi wants to reward her mother's crappy behavior by allowing her to be around their family like everything is A-okay, then he has every right to want to remove himself from the situation. Kandi offers to split the holidays between the feuding mothers. So on Thanksgiving, they can be with Mama Joyce, and for Christmas they can be with Ms. Sharon. Todd says he doesn't really care to be around Mama Joyce at all. If Ms. Sharon were still here (R.I.P.) I think splitting the holidays would have aided in the demise of Kandi and Todd's marriage. But don't get it twisted, things aren't going to be all peaches and cream just because Ms. Sharon is now deceased. I'm sure Todd still has resentment and anger towards Mama Joyce for the way she treated his mother. I really can't see him getting over it, and since Mama Joyce needs to be so involved in Kandi's life at all times, she's just going to continue to cause problems until they end up filing for divorce and going their separate ways. You know that a divorce is what Mama Joyce wants at the end of the day anyway! Claudia takes her mom and grandma to a drag queen bar and the ladies have drinks and chat about Claudia finally get knocked up. Claudia is feeling the pressure because she's 41 now (my gawd, she is a flawless looking 41-year-old!) Her mom wants her to hurry up and have a little Claudia or Claudio and she doesn't care if she has the kid out of wedlock. Damn, mama sounding kind of desperate, right? Nene, Cynthia, Porsha and Kenya meet up to discuss their issues and finally squash their beef once and for all. Nene is trying to get to the bottom of her issues with Cynthia, but Kenya keeps butting in every two seconds! Kenya's faux concern was irritating. She has known Cynthia for two minutes, and she already has her cape on and coming to the rescue. After a lot of back and forth, Nene and Cynthia hug it out. But, once again, the makeup seemed forced and inauthentic. Cynthia kept kissing on Nene like they were BFFs again, and Nene was just like "um, okayyyy." It was so awkward! Poor Cynthia is desperate to get that old thang back. Now it's time for Porsha and Kenya to make up. Kenya apologizes for the part she played in getting her hair snatched at the reunion. And Porsha, well Porsha didn't really apologize for anything at all. They give each other a pity hug but you could tell Porsha wasn't feeling it. I tweeted that neither Porsha nor Nene were ready to move forward, and Porsha favorited my tweet, so you know it's real! So there you have it. The beef was not squashed at that table, and it's unlikely that these four will ever be friends. I asked my Twitter followers what they thought about Kenya's apology and the consensus was that Kenya was being fake during the meeting. 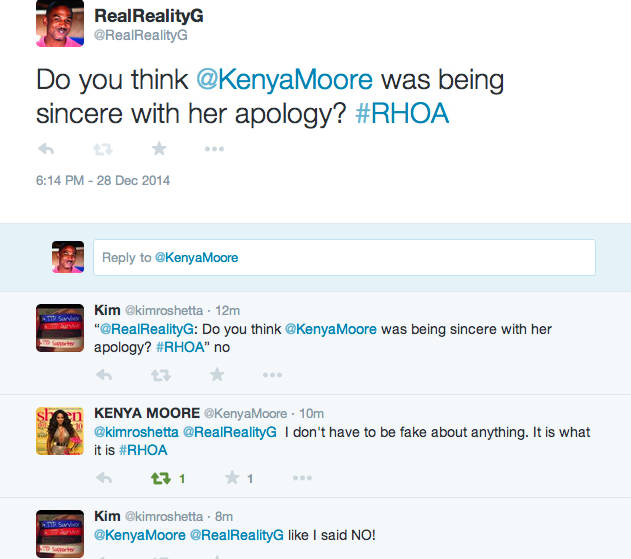 Well, Ms. Kenya Moore (a.k.a. always the victim) came to her own defense. By the way, if you're not following me on Twitter, you're missing out! I'm constantly getting dragged, ethered, and blocked by reality stars. Follow me and join in on the fun! What did you think about The Real Housewives of Atlanta episode 8 "Tea With a Side of Squashed Beef"? Do you think Nene and Cynthia and Porsha and Kenya will ever be friends? Great Recap....I love your Blog! If by chance I miss a show, you break it down perfectly! Keep up the great job!